This page contains everything you need to know about the strategy, tips and tricks in Destiny 2 Boss Guide: Defeating Fallen Captain Jaliks. Fallen Captain Jaliks can be found just right after you defeat the Gate Lord, Acanthos and proceed to where the Cayde-6 unit can be located. You will find him trying to break the barrier that the Cayde-6 unit has put up in the hopes of discouraging the Fallen from proceeding. Be mindful though as the Fallen Captain is not alone. He is accompanied by several Shanks which are really annoying with all the blasters they are shooting on you. The Fallen Captain has a lot of Shanks in his disposal so you might want to take them out first as they have relatively low hp and can be easily dealt with. Position yourself somewhere on higher ground just above the stairs where there are several objects that you can use as a way to block off enemy fire. In here you can try to whittle away the Shanks by shooting them first. This will ensure you not getting blasted by annoying shots from the Shanks and allow you to focus on the Fallen Captain alone. Once you have cleared off all the Shanks, you can now start focusing on the Fallen Captain. Be mindful though as Jaliks can easily move about and use his stealth to reposition himself if he finds it a little disadvantageous. Shoot him on the head where it counts most so you can deal greater damage than shooting him in the body. Once you dealt enough damage, you might already be capable of going Super. Going head to head with Jaliks is the fastest way in killing him as you deal massive amounts of damage. After you killed Jaliks, a lot of remnant troops will remain. 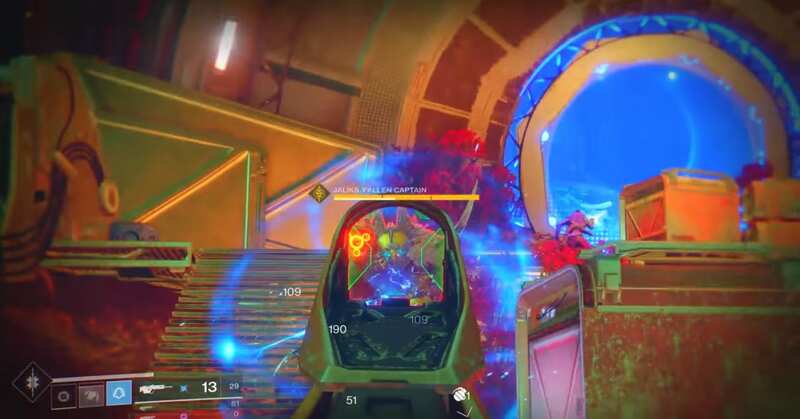 Use the dropped Scorch Cannon to finish of the remaining enemies so you can get back to the Cayde-6 unit and reunite with them.